Quite a while ago, a friend of mine gave me a picture she had taken of a mutual friend and asked if I would like to see what I could do with it. It has sat in my collection of photo references for over a year. I wanted to try a figure on the masa paper and the above is what I came up with. I painted the figure, first, and then went in search of ideas. The interesting thought I had was that notes probably came from many sources. The background could have been a city or an event but I wanted it to portray something a little more far-reaching and, perhaps, more soulful and contemplative. I placed him in nature and greeting a new day. I have painted this West Highland before, here. This painting was painted on toned masa paper. Due to the toned surface, I used white gouache for the whites on the nose and horns. The whiskers were painted in with the use of a rigger brush and white acrylic. 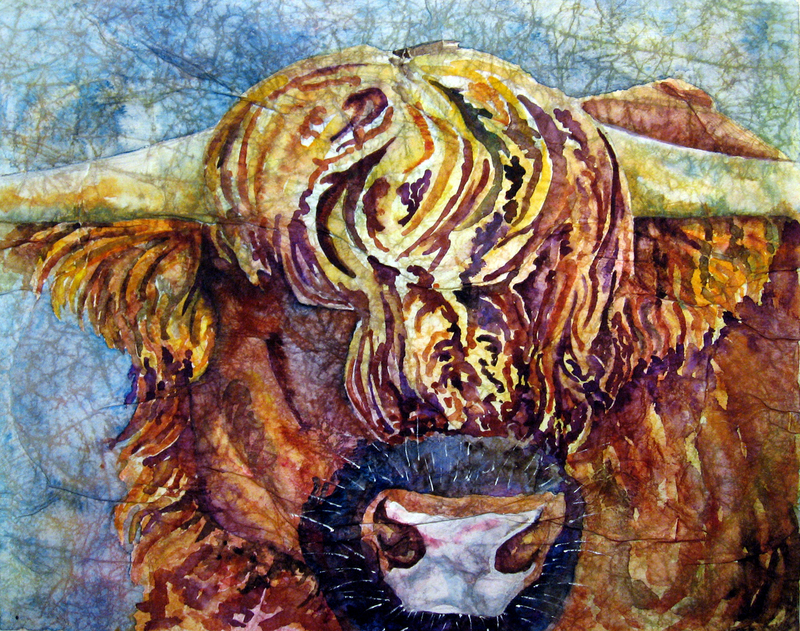 More on West Highland Cattle, here. A New Year brought me a new adventure, already! I read an article about the artist, Kathleen Conover, in my February copy of Watercolor artist, February 2012. 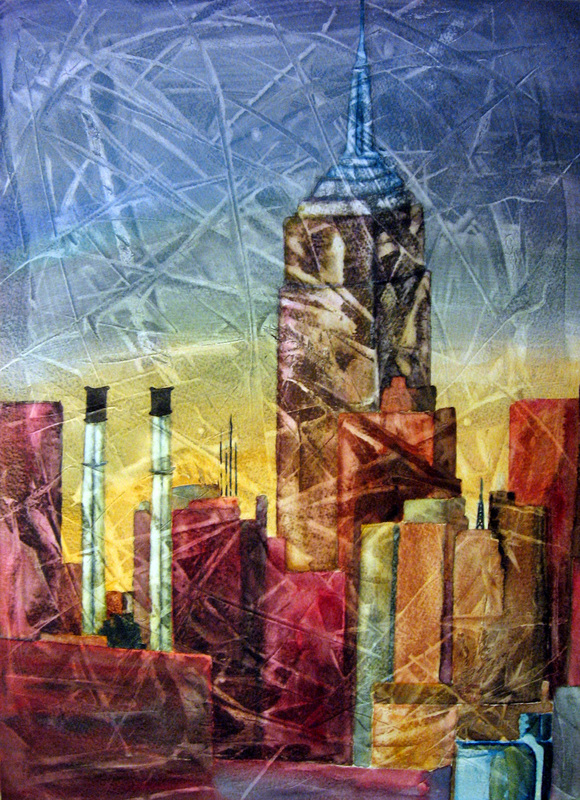 I was so taken with her work that I decided to try this “gesso juice” mixture she spoke of to surface her paper with. The recipe for “gesso juice” is 1/2 part white acrylic gesso, 1/4 part clear acrylic matte medium and 1/4 part water. After mixing this up, I poured some on my taped down watercolor paper and spread it with a credit card, making slashes and dashes and all kinds of shapes on the surface. I waited for the gesso juice to dry and painted in my initial washes. The surface is very much like painting on gesso. 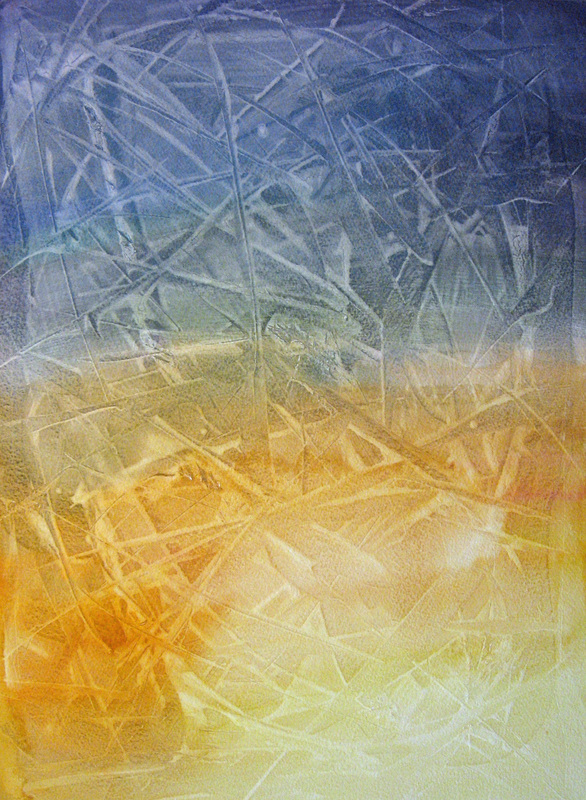 The paint does not sink down into the surface of the paper and mingles differently on this surface. It required more pigment to achieve the above effect. I had to paint quickly so the side-by-side colors mixed without a hard edge. I waited for the above washes to dry and the surface go flat again. I drew my composition on the surface and began painting the varied shapes in, being mindful of my values. This was probably the most difficult phase for me. On this surface, I found, the darks had to be painted with strong dark colors as dark lights just appeared light still, unlike painting directly onrto watercolor paper. So, I learned a lot about my palette through this exercise. I, now, am getting a better feel for their properties. Value is all important while painting on this surface. I finished blocking in my composition of shapes and buildings. In this step, I changed a few colors of the buildings and lifted paint in a lot of areas to show the different patterns, especially on or around the Empire State Building. I darkened a few of the darker value areas and put in a few details on the smokestacks and the antennae on the tops of a couple buildings. 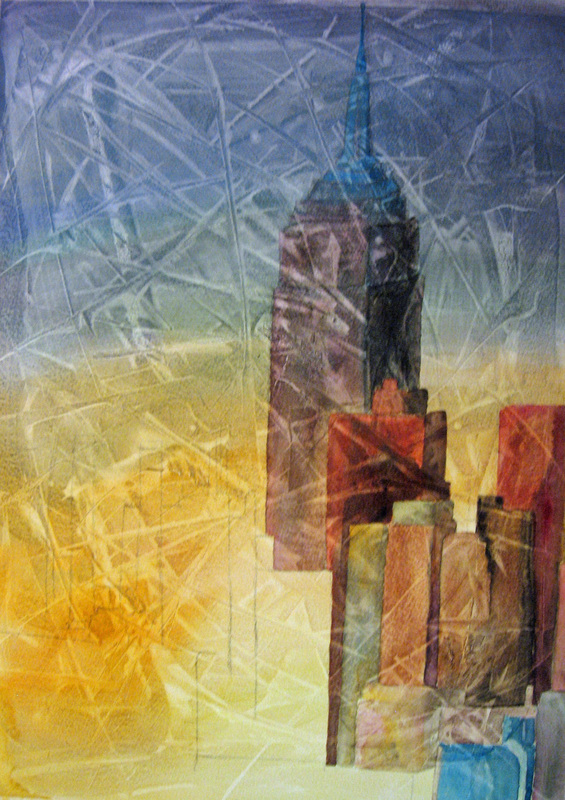 I lifted out a lot of the blue on the point of the Empire State so it would show up more. To finish, I splattered some darks I’d used and lifted lights out around the buildings by scumbling some water in those areas and dabbing with a paper towel. I want to do more of these and explore and explore!